The Priory Church of St. Mary is of 8th Century origin, and is one of the finest church buildings in England to have survived from before the Norman conquest. 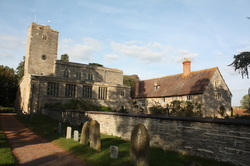 Deerhurst church is also very much a living parish Church. It is the parish church of Deerhurst with Apperley and is part of the Severnside Benefice, a group of 5 parishes - Deerhurst with Apperley, Forthampton, Chaceley, Tredington and Stoke Orchard with Hardwicke. BCP means the service is according to the Book of Common Prayer of 1662. Other services are in modern language. This pattern of services will vary at certain times of year, e.g. Christmas and Easter. For details see church noticeboards and the Severn-Sider parish magazine. High on the wall of the nave you can see the marvellous double-headed window pictured above. As you enter Deerhurst Church you can feel the years of history surrounding you. Worship has been offered in this setting continually for almost 1300 years. - The Saxon font which stands in the north-west corner of the church. This was discovered over a hundred years ago being used as a drinking trough in a local farm. It is carved from a single block of limestone, with a spiral decoration. The Cassey brass at the east end of the north aisle. Sir John Cassey of Wightfield who died in 1400 was Chief Baron of the Exchequer. The brass contains a very rare example of a named animal (the dog named "Terri" or perhaps "Cerri"). Thank you to Martin Griffiths for the photos on this page. For further information about Deerhurst Church visit the Friends of Deerhurst Church website, which gives a detailed history of the church and news of lectures and events organised by the Friends. Find out more about the St Alphege of Deerhurst, and the Deerhurst Flower Festival which are also featured on this website.